“Chucky”, as Vassily Ivanchuk has been nicknamed, has one of the most original, unpredictable styles of play in the recent generation. His play reminds many of Bent Larsen who was also extremely creative on the chessboard as well. As an eccentric and unique player, Ivanchuk has many tournament successes and played for the World Championship, but he’s also had a number of failures as well. This makes him an extremely interesting player to watch in chess. 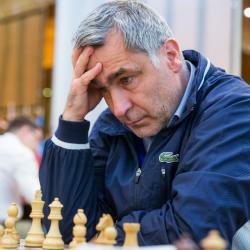 Vassily Ivanchuk was born in Ukraine. He won the 1987 European Junior Chess Championship at a young age. He then won the 1988 New York Open ahead of many top players and this gained him recognition from the world. Shortly after this tournament, Ivanchuk was given the Grandmaster title and also became one of the top 10 players in the world too. After placing high in numerous tournaments, Ivanchuk played for the World Championship title in 2002. He lost this match though, and has been known to play poorly in match-play ever since then. Despite not being a strong player in matches, he has countless tournament victories to his name and continues to be a top 30 player in the world to this day.